A forum to discuss the myriad ways in which adults struggle to find their place in youth sports. I welcome your observations and experiences. Back in 2009, I wrote an article for the New York Times citing a study that concluded there isn't much evidence to link curveballs and arm problems among kid pitchers. According to the study, the far more serious problem was overuse - too many pitches thrown over seasons dragging on too many months. It turned conventional thinking about kid pitchers and throbbing elbows on its head. Yet the study's primary author, Glenn Fleisig, was quite sure about which way his data pointed. Why for so many decades have most doctors and youth coaches believed otherwise? Fleisig said the evidence had been based largely on anecdotes, and that over the years those stories simply began to sound like fact. “Why did people believe the world was flat? Because one guy told another it was flat and it looked flat. Until someone discovered that it wasn’t,” he said. Fleisig took a lot of heat for the study and for refusing to back away from its conclusions. This week, vindication of sorts. A five-year study conducted at the University of North Carolina and commissioned by Little League Baseball reached the same conclusion. As Glenn said in the Times article, no one is urging ten-year-olds to snap off a curve every other pitch. But data are data, and the curveball apparently isn't as harmful as many of us thought. And I have both hands raised on this one. In 2005, I wrote a piece for the Times lamenting the all-curve all-the-time approach of many youth pitchers at the Little League World Series. I should have been writing about pitch counts. I think the pitch count is important, but I also think many little league players are taught the wrong mechanics which leads to arm problems. Marie Hardin, associate director of the Center for Sports Journalism at Penn State University, also gives props to Youth Sports Parents at her blog, "Sports, Media & Society." Track Mom.. "Everything Youth Track and Field"
Wall Street Journal's "The Juggle." Do I have to play? 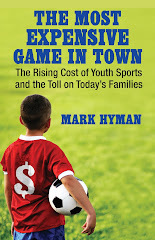 Have Youth Sports Become Too Intense?